The Pharisees tested Jesus throughout the Gospels. They wanted signs to prove he was really God, asked tricky questions, and tried to prove Him wrong. But, why? Before this encounter, Jesus performed miracle after miracle: cleansing lepers, healing paralytics, raising Jairus’ daughter from the dead, and immediately before this Gospel, feeding four thousand people with a few fish. What more could they want from Him? The Pharisees were looking for a specific sign that their place of honor in Jewish society will be rewarded with a powerful position in Jesus’ kingdom. They wanted Jesus to give them the power and honor that they feel they deserve. Like the Pharisees, I often want signs from Jesus, too. I make deals with him – if he does this, I’ll do that. If I pray he takes away some suffering or hardship from my life, I’ll try harder to be a better person. If I light a votive candle, my special request will be answered. If I go to Mass every week, my life will go smoothly. And if I do all these things, and nothing happens, if Jesus doesn’t give me a sign, well, maybe the Pharisees were right all along. Maybe Jesus really isn’t God after all. But Jesus doesn’t work this way. Our relationship with Him can never be transactional. It can’t be used to bargain or make deals. Jesus, by virtue of being God, already has everything. So, there is nothing we can give God that he needs. But, we can give him what he wants – our love. Look at the people in the Gospels who don’t expect anything but receive signs from Jesus. They don’t go to him with a list of reasons why he should do what they ask of Him. They call out to Him. They push through the crowds, they drop everything to follow Him to a remote hillside without any idea of how they’ll find dinner. They have faith that God will give them a sign, and they are right. In return, they give Jesus their faith, hope, and love. The Pharisees demand a sign, and they leave empty-handed. What do we ask of God? What deals do we try to make? May we pray this week to not seek signs, but for the faith to believe God really does have a plan for us, and his plan is good. Why do Catholics use the crucifix instead of a cross? After all, Jesus is not dead, He is alive. A crucifix is a cross with Jesus’ Corpus, a representation of his crucified body. A cross bears either no figure at all, or one like the Risen Jesus. There are a few ways to answer this question, so let’s start with the Mass. Simply put, the General Instruction of the Roman Missal requires a crucifix be clearly visible either on or near the Altar for Mass. The crucifix is there to remind us of the sacrifice Jesus made which becomes present every time we celebrate Mass. Not that Jesus is sacrificed again at every Mass, but that we are REMINDED of the sacrifice he made for us. A plain cross just doesn’t have the same impact. The Crucifixion of Jesus is a one-time event that can never occur again in history. But it is an event which should never be forgotten. We need to be reminded of what Jesus endured to prove to us that His way is the way into the Kingdom – that He IS GOD, not just someone telling us stories to make us feel good. Remembering Christ’s Passion, death and resurrection helps us get though our own daily sufferings and struggles – to spiritually grow from them. Because Jesus’ victory over death is not just physical death, but our road to victory over a spiritual death. “Spiritual death” can sound scary. But that’s what Jesus was talking about when He told Nicodemus “unless one is born again he cannot see the Kingdom of God (John 3:3.”) When we die to our old self, we rise to a level of spirituality, we are “born again” into a union with God. Finally, St Paul said to “preach Christ crucified (1 Corinthians 1:23. )” In fact, many of Paul’s scripture writings are based on the sacrifice Jesus made for us on the cross and His victory over death – physical death and spiritual death. 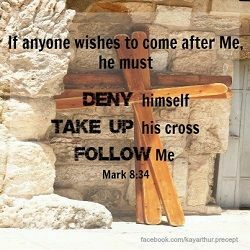 By reflecting on our daily struggles with Jesus hanging on the cross, we better understand what Jesus meant when he said to “deny yourselves, take up your cross, and follow Me” (Matthew 16:24). How can we be born again if we are constantly reminded of Jesus being dead instead of alive? The answer is found from what goes on inside our heart when we sit and reflect on Jesus hanging on the cross. When suffering comes our way, the image of the crucifix can give us spiritual strength and inspiration because of what Jesus did for us. The image of the crucifix, is placed in our homes, our churches, our schools, or our hospitals, to make sure that this sacrifice of our Lord for us is not forgotten. It is a visual reminder of Christ’s battle over sin, the turning point in our spiritual battle, so we never forget God’s redeeming love for us. 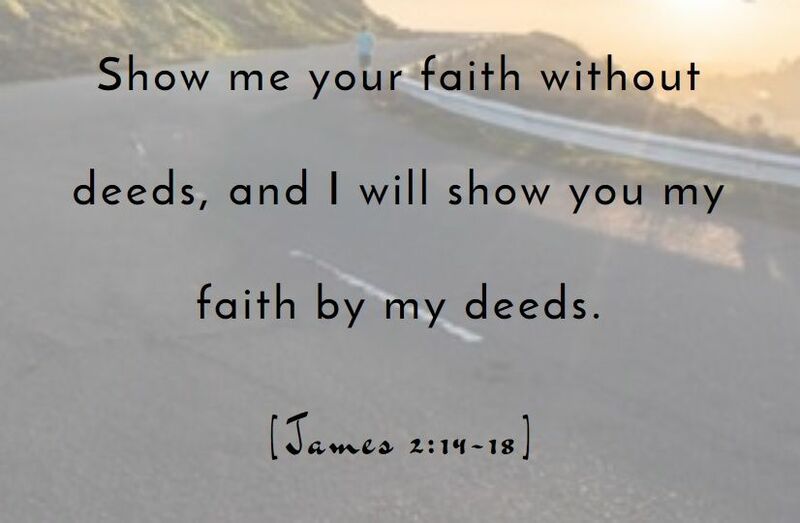 “What good is it…if someone has faith but does not have works?…If a brother or sister has nothing to wear and has no food for the day, and one of you says to them, “Go in peace, keep warm, and eat well, but you do not give them the necessities of the body, what good is it (James 2:14:17)?” Those are the words of St. James in his letter circulating around the house churches in the early days of Christianity. James’ letter goes far beyond being donors, volunteers, caregivers, and ministers. It goes directly to the heart of spending our day in the marketplace – those places we where we live, work, study, and play every day. During a state of the company address in my former life, our CEO presented his thoughts on what it would take to be successful given the global economic crisis at the time. He said “we must continue to look for ways to be smarter about the projects we bring forward for approval.” Now that made sense, but I didn’t see projects fail because we weren’t clever enough to know they were bad deals. I saw projects failing because of greed for personal gain or hastened to meet company goals. Faith and economics rarely encounter each other in the business world. St. Pope John Paul II recognized this when he wrote “…on the one hand, [is] the all-consuming desire for profit, and on the other, the thirst for power, with the intention of imposing one’s will upon others. In order to characterize better each of these attitudes, one can add the expression: at any price (Sollicitdo Rei Socialis §V.37. )” He argued that accumulation of profit and power cannot be measures of success in business unless they are reinvested back into society to promote the social, cultural, and spiritual well-being of people (§II.9). In other words, making better projects and business deals is not so much about being smarter as it is to be grounded in our faith. Making business decisions which consider the greater good, instead of personal gain or maximizing corporate profit, far benefits the company, the employees, and the community as a whole. For the Christian leader in the marketplace, faith and works are not an “either/or” option. They are a “both/and” necessity for ethical business life. To tell an employee “have a good weekend” rings hollow when that same employee is facing low wages, long hours, no insurance, or loss of their job. Being a Christian leader in the marketplace takes prudence, planning, wise counsel, courage, and compassion. Daily decisions involving cost cutting, maximizing profits, optimizing equipment maintenance, business unit performance, and product value tradeoffs are a reality in the business world. But then so does God’s expectation that our faith and works become one. Ethical life for a Christian in the marketplace is a reflection of Christian discipleship. For Faith without works is me meaningless.